Will the move to extend the round drop per cow production? Are the farm team happy to continue 3in2 or not? If paddocks exceed APC of 3300 kg DM/ha, they will be harvested as baleage. The intention is to keep an even approach towards the 4 different farmlets. If the winter feed budget allows, fodder beet may be considered as a supplement for 2 of the herds late season, in preparation for wintering on fodder beet. 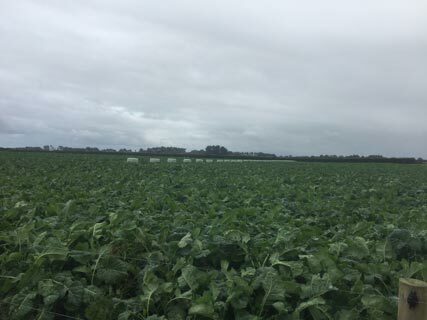 Fungicide spray (recommended by our agronomy support PGGWrightsons) applied to 12ha of beet, mixed with a thistle spray to control thistles present in the beet. A second fungicide spray due on same area at the end of month. Spray has a 42 day with holding period so half of the beet area was sprayed to allow for potential late lactation grazing (should feed budget and yields allow). No spray drift onto surrounding pasture paddock. Our research tech team had to allow 24 hours post spray before entering to avoid contact with residues. No N applied this week – planning a light dressing on the support block this week. The herd had an empty rate of 7 – 11%. This is either 7% of cows scanned or 11% of cows mated. The 11% is from that start of mating inclusive of cows culled due to the Staph outbreak and the dry period.